বোয়িং ৭৭৭-২০০ইআর ২ — ১২ ২১ ২৮৬ ৩১৯ ইজিপ্ট এয়ার থেকে লিজ নেওয়া. ড্যাশ ৮ কিউ৪০০ ৩ — — — ৭৪ ৭৪ স্মার্ট এভিয়েশন থেকে লিজ নেওয়া. ↑ ক খ The History of Biman Bangladesh Airlines. Jatree, Page 6. Biman Bangladesh Airlines. January–March 1987. ↑ "Head Office ওয়েব্যাক মেশিনে আর্কাইভকৃত ১ জুলাই ২০১৩ তারিখে." Biman Bangladesh Airlines. Retrieved 5 June 2011. "Head office BIMAN BANGLADESH AIRLINES LTD. HEAD OFFICE, BALAKA KURMITOLA, DHAKA-1229 BANGLADESH"
↑ "Airline accidents" (pdf)। Flight International: 1987। ১৫ ডিসেম্বর ১৯৭৯। সংগ্রহের তারিখ ২৪ আগস্ট ২০১১। Four crew were injured when a Bangladesh Biman F.27 crashed during a training flight from Dacca on November 18. It is reported to have made a forced landing without power. ↑ "Chronology of Biman mishaps"। The Daily Star। ৯ অক্টোবর ২০০৪। ২৭ মার্চ ২০১২ তারিখে মূল থেকে আর্কাইভ করা। সংগ্রহের তারিখ ২৭ মার্চ ২০১২। On December 22, 1997 a Fokker-28 with 89 people aboard crashlanded in Sylhet, leaving 17 people injured. 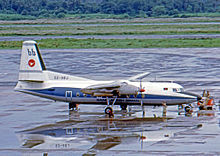 The aircraft landed on its belly in a paddy field, 3 km from the runway, failing to land at Sylhet Airport due to heavy fog.